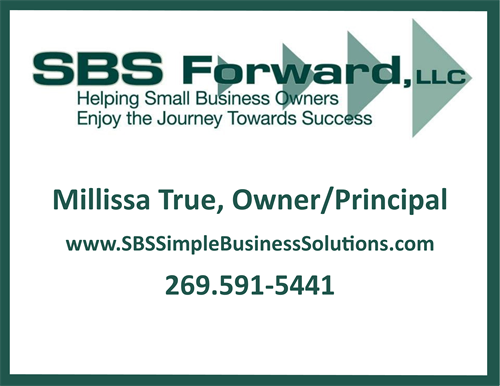 Millissa True, owner of SBS Forward, LLC, formed SBS in 2008 with one dream -- to help small business owners succeed and enjoy the journey as they achieve success. SBS Forward is unique in offering its clients both marketing and HR related services, which create the perfect combination for small business owners who typically wear many hats as they manage the day to day aspects of their business. SBS Forward offers relational marketing services that center around how best to engage, attract and interact with your customers. Relational and positional marketing have been utilized for years, however, the tools that business owners can now use have changed drastically. SBS can help you evaluate effective and affordable ways to engage your customers & build revenues, while also assisting clients in managing the internal dynamics of their organization. By helping organizations better engage with their employees, they become better positioned to engage with their customers. One primary goal of SBS Forward is to revolutionize the way business owners and employees view relationships by adopting a deeper more thought provoking philosophy of relationship engagement. First and foremost, business owners must realize that true success starts from within the organization. A healthy company on the inside sets the stage for a healthy company on the outside. Primary office located in historic downtown New Bern on the corner of Craven & Front Street.